Born: 1 May 1779 Anchorfield, Edinburgh, Scotland. Died: 14 March 1866 Currie, Edinburgh, Scotland. Alexander Morison was born and educated in Edinburgh, taking his MD in 1799, then moved to England to build a private practice specializing in mental diseases. He became inspecting physician to the madhouses of Surrey in 1810, consulting physician to Hanwell Asylum in 1832, and one of two visiting physicians to Bethlem Royal Hospital in 1835. Most of his income, however, was derived from the professional attention he gave to his aristocratic clientele. Morison's publications included Outlines of Lectures in Mental Diseases (1826), Cases of Mental Diseases (1828) and The Physiognomy of Mental Diseases (1840). 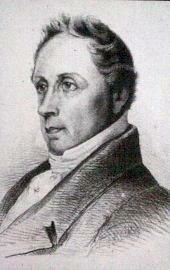 Inspired by lectures given by Esquirol in Paris (whom he first visited in 1818, and on several occasions thereafter), Morison began his own series of lectures on mental diseases - the first to be held in Britain - in 1823, and continued regular series of lectures in London and Edinburgh for the next thirty years. At Hanwell and at Bethlem, Morison was a moderate supporter of "moral management" treatment regimes. He did not, however, advocate the total abolition of means of restraint such as straitjackets. This compromise stance cost him his role as consultant to Hanwell in 1840, by then run by Dr John Conolly. Then, in 1852, Morison became embroiled in a controversy over the treatment of Bethlem patients. In the ensuing Commission on Inquiry, details emerged of his remoteness from the day-to-day management of hospital affairs. He retired from his post at Bethlem in 1852, at the age of seventy-three, and was replaced by Dr Charles Hood, Bethlem's first resident physician and an ardent advocate of non-restraint. Morison returned to Scotland, where he died in 1866 aged eighty-six.